This graceful pedant combines a delightful swish of polished 14K yellow gold with over a third carat of diamonds to create a celebration of the love that has swept you head over heels. The left side of this pretty heart is crafted from a swirl of yellow that gold appears to have been painted with a skillful flourish, while on the right, a total of 13 diamonds twist in unison to give this contemporary piece a dose of sparkle and timeless appeal. 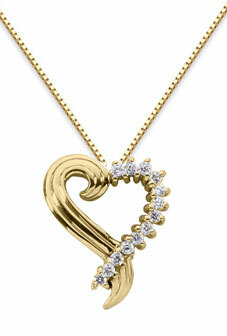 We guarantee our 0.39 Diamond Swirl Heart Necklace, 14K Yellow Gold to be high quality, authentic jewelry, as described above.